repair the drawing whenever it's damaged. You should use widgets whenever possible because they do all of the above themselves. Tells the application what has been damaged. Position it where you want your drawing to appear. An initialization function that's called before the widget's extent is calculated. If provided, calculates the widget's extent when the widget is moved or resized. Calculates the raw widget's opacity tile list. Called as the last stage in realizing the widget, just before any required regions are created. Most of the time you'll need to specify only the drawing function (see below). You can use PhAB's function editor (described in the Editing Resources and Callbacks in PhAB chapter) to edit these resources — but you must give the raw widget a unique instance name first. You can also set these resources in your application's code; for more information, see “Function resources” in the Manipulating Resources in Application Code chapter. For information on PtRaw's resources, see the Photon Widget Reference . The call to PtSuperClassDraw() (described in the Building Custom Widgets guide) invokes PtBasic's draw function, which draws the raw widget's borders, fills the widget, and so on, as specified by its resources. The raw widget can do all this by itself, but using PtSuperClassDraw() reduces the complexity of the raw drawing function. You'll need to know the raw widget's canvas. The origin for the drawing primitives is the top left corner of the canvas of the raw widget's parent, not the raw widget itself. You'll need to translate the coordinates. The raw widget can draw beyond its canvas, but it's not a good idea. You should set up clipping in the drawing function. The drawing function is passed a list of damaged areas that can be used to speed up repairs. For raw widgets whose contents change dynamically, you can define a model that describes what to draw. These are described below, followed by some examples of simple drawing functions. Don't call PtBkgdHandlerProcess() in a PtRaw widget's drawing function. Don't change any other widget in any way (creating, destroying, setting resources, and so on) in a raw widget's drawing function. It's safe to get resources from other widgets. Don't call the drawing function directly from your program. Instead, damage the widget by calling PtDamageWidget(), and let the library call the drawing function. You'll need this canvas to perform any required translations and clipping. The origin for the drawing primitives is the upper left corner of the raw widget's parent's canvas. You'll probably find it easier to use the upper left corner of the raw widget's canvas as the origin. It can mess up the rest of your application's interface. If the raw drawing beyond the raw widget's extent is damaged but the raw widget itself isn't, the raw widget's drawing function isn't called, so the damage won't be repaired. It's possible to write the drawing function so that clipping isn't needed, but it can make your code more complicated. For example, if you try to write text that extends beyond the raw widget's canvas, you might need to draw partial letters. You'll also have to consider what happens if the user changes the size of the raw widget. If your raw widget's drawing function takes a lot of time, you might not want to redraw the entire canvas when a small portion of it has been damaged. You can speed up the repairs by using the drawing function's damage argument. A PhRect_t structure that defines the damaged area. A pointer to the next tile in the list. The damaged areas are relative to the raw widget's disjoint parent (usually a PtWindow widget). Use PtWidgetOffset() to obtain the offset. If the contents of the raw widget are static, you can call the Pg drawing primitives directly from the raw drawing function. If the contents are dynamic, you'll need to define a data structure or model that describes them. The structure of the model depends on your application; the raw drawing function must be able to traverse the model and draw the required graphics. Use the raw widget's Pt_ARG_USER_DATA or Pt_ARG_POINTER resource to save a pointer to the model. Colors are specified in the Photon microGUI with the PgColor_t type. The library and graphics drivers interpret this data type according to the current color model (described in the documentation for PgColor_t). Macros for the most commonly used colors are defined in <photon/Pg.h>. Although PgColor_t uses 32 bits, only 24 bits are used per color. This representation is called true color. The Photon microGUI is a true-color windowing system; it uses this 24-bit RGB representation internally. Most graphics cards currently use true color (24 bits) or high color (16 bits). However, some graphics drivers take advantage of the palette on older palette-based cards. When doing raw drawing, you can set various attributes, including fonts, palettes, fill colors, line colors and styles, and text colors. The attributes that you set affect all raw drawing operations until you set them again. For example, the line color affects all lines, pixels, and bitmaps that you draw using the drawing primitives. You don't need to set these attributes if you're using widgets; the drawing attributes are set based on the widgets' definitions and resources. However, in all other cases you should set these attributes before you begin drawing. The defaults are undefined and drawing before setting the relevant attributes may produce unexpected results. Create a PtRaw widget and call the primitives in its draw function. See the section on the PtRaw widget earlier in this chapter. Use the corresponding graphical widget. For more information, see PtGraphic in the Photon Widget Reference . By using each primitive's flags, you can easily draw an outline (stroke), draw the filled “inside” (fill), or draw both as a filled outline. The current fill and stroke attributes are used. For more information, see “Drawing attributes,” earlier in this chapter. The mx versions of these functions place the address of the primitive into the draw buffer in your application's data space. When the draw buffer is flushed, the primitive is copied to the graphics driver. The non-mx versions copy the primitive itself into the draw buffer. You can draw rectangles, using the current drawing attributes, by calling PgDrawIRect() or PgDrawRect(). PgDrawRect() uses a PhRect_t structure (see the Photon Library Reference ) for the rectangle coordinates, while PgDrawIRect() lets you specify the coordinates individually. Use whichever method you want. Rounded rectangles are programmed almost the same way as rectangles — just call PgDrawRoundRect() with a PhPoint_t parameter to indicate, in pixels, the roundness of the rectangle corners. The radii are truncated to the rectangle's sides. If you set Pg_DRAW_FILL or Pg_DRAW_FILL_STROKE in the flags argument, the area of the beveled box is filled according to the current fill attributes. If you set Pg_DRAW_STROKE OR Pg_DRAW_FILL_STROKE in the flags, the top and left edges are drawn according to the current stroke attributes, and the bottom and left edges are drawn with an extra color that's passed as one of the parameters. There's also a parameter to let you set the with or “depth” of the bevel. If you want to draw an arrow that fits inside a given rectangle (for example, the arrow for a scrollbar), call PgDrawArrow(). You can create polygons by specifying an array of PhPoint_t points. If you use Pg_CLOSED as part of the flags, the last point is automatically connected to the first point, closing the polygon. You can also specify points relative to the first point (using Pg_POLY_RELATIVE). When you cross an odd number of lines, you're inside the polygon, so the area is filled. The even-odd rule applies to both the PgDrawPolygon() and PgDrawPolygonmx() functions. You can also call PgDrawEllipse() to draw an ellipse. The start and end angles of arc segments are specified in binary gradations (bi-grads), with 65536 bi-grads in a complete circle. If the shape you want to draw can't be expressed as any of the other shapes that the Photon microGUI supports, you can draw it as a series of spans by calling PgDrawSpan(). Lines created by the drawing primitives. Text is drawn using the current text attributes; for more information, see “Text attributes,” above. If you set flags to Pg_BACK_FILL, the text's extent is filled according to the current fill attributes (see “Fill attributes”). 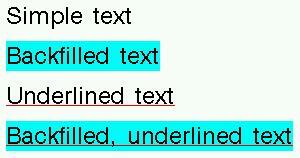 If you define an underline with PgSetUnderline(), the underline is drawn under the text and on top of the backfill. Text created by the drawing primitives. A bitmap with a transparent background. image data — a matrix of colors (but not necessarily of type PgColor_t). Each element in the matrix is the color of a single pixel. Direct-color images have a type that starts with Pg_IMAGE_DIRECT_. image data — a matrix whose elements are offsets into the palette. Palette-based images have a type that starts with Pg_IMAGE_PALETTE_. Colors are algorithmically generated as a gradient between two given colors. You can define any image by its pixel size, bytes per line, image data, and format. Images can be stored in structures of type PhImage_t (described in the Photon Library Reference ). The type field of this data structure identifies the type of image. Palette-based images provide a fast, compact method for drawing images. Before drawing a palette-based image, you must set either a hard palette or soft palette to define the colors for the image. Setting a hard palette changes the physical palette. All colors set with a PgSetFillColor() function are chosen from this palette. Other processes continue to choose colors from the Photon microGUI's global palette and may appear incorrect. When you release the hard palette, the other processes return to normal without being redrawn. You should always release the hard palette when your window loses focus. Setting a soft palette lets you redefine how colors are interpreted for the given draw context without changing the physical palette. All colors in the soft palette are mapped to the physical palette. If your physical palette uses more colors than your graphics card supports, some colors are dropped, and the image won't look as nice. With direct-color images, every pixel can be any color. But compared to palette-based images, the image data is larger and the image may take longer to draw. You can choose from several types of direct-color images, listed in the description of PhImage_t in the Photon Library Reference ; each has a different image-pixel size and color accuracy. With gradient-color images, colors are algorithmically generated as a gradient between two given colors. Call PxLoadImage() to load an image from disk. Call ApGetImageRes() to load an image from a PhAB widget database. Get the value of the Pt_ARG_LABEL_IMAGE resource of a PtLabel or PtButton widget (provided the widget's Pt_ARG_LABEL_TYPE is Pt_IMAGE or Pt_TEXT_IMAGE). Allocate it and fill in the members by hand. It's better to call PhCreateImage() than to allocate the structure and fill it in by hand. Not only does PhCreateImage() provide the convenience of setting up a blank image, but it also observes the restrictions that the graphics drivers impose on image alignment, and so on. The image_tag and palette_tag members of the PhImage_t structure are used for caching images when dealing with remote processes via phrelay (see the QNX Neutrino Utilities Reference ) for example, when using phindows. These tags are cyclic-redundancy checks (CRCs) for the image data and the palette, and can be computed by PtCRC() or PtCRCValue() If these tags are nonzero, phindows and phditto cache the images. Before sending an image, phrelay sends its tag. If phindows finds the same tag in its cache, it uses the image in the cache. This scheme reduces the amount of data transmitted. You don't need to fill in the tags if the images don't need to be saved in the cache. For example, set the tags to 0 if you're displaying animation by displaying images, and the images never repeat. PxLoadImage() and ApGetImageRes() set the tags automatically. PhAB generates the tags for any images generated through it (for example, in the pixmap editor). Create a transparency mask for the image. Chroma is accelerated by most hardware, whereas transparency bitmaps are always implemented in software. To make a given color transparent in an image, using chroma if possible, call PhMakeTransparent(), passing it the image and the RGB color that you want to be made transparent. The mask_bpl member of the PhImage_t structure specifies the number of bytes per line for the transparency mask. You can build a transparency mask by calling PhMakeTransBitmap(). If you use PxLoadImage() to load a transparent image, set PX_TRANSPARENT in the flags member of the PxMethods_t structure. If you do this, the function automatically makes the image transparent; you don't need to create a transparency mask. If the image is stored in a PhImage_t structure, call PgDrawPhImage() or PgDrawPhImagemx(). These functions automatically handle chroma key, alpha operations, ghosting, transparency, and so on. To draw the image repeatedly, call PgDrawRepPhImage() or PgDrawRepPhImagemx(). To draw a rectangular portion of the image, call PgDrawPhImageRectmx(). If the image isn't stored in a PhImage_t data structure, call PgDrawImage() or PgDrawImagemx(). If the image isn't stored in a PhImage_t structure and has a transparency mask, call PgDrawTImage() or PgDrawTImagemx(). Set the Pt_ARG_LABEL_IMAGE resource for a PtLabel or PtButton widget (which use PgDrawPhImagemx() internally). The widget's Pt_ARG_LABEL_TYPE must be Pt_IMAGE or Pt_TEXT_IMAGE. The mx versions of these functions place the address of the image into the draw buffer in your application's data space. When the draw buffer is flushed, the entire image is copied to the graphics driver. The non-mx versions copy the image itself into the draw buffer. If you do this, the image data isn't copied to the graphics driver. The images created and returned by ApGetImageRes() and PxLoadImage() aren't in shared memory. Calling PhReleaseImage() with an image frees any resources that have the corresponding bit set in the image flags. PhReleaseImage() doesn't free the PhImage_t structure itself, just the allocated members of it. PhReleaseImage() correctly frees memory allocated with PgShmemCreate(). When should you set the release flags? When you know that the image is referred to only by one entity. For example, if one widget will be using an image, then it should free the image once it's done with it. If you set the release flags appropriately, prior to setting the image resource, then this will happen automatically — that is, the widget will free the image and data when it's destroyed, or you apply a new setting for the resource. Release the image in a Pt_CB_DESTROYED, but you would need to be sure that no other widgets are using it. If you know that one widget will survive the rest, then release the image in its Pt_CB_DESTROYED. Otherwise you need a more sophisticated approach, like your own reference count. Alternatively, if you know one widget will outlast all the others using the image, then set the release flags in the structure prior to setting the image resource of that widget. All the rest should have the flags clear. Note that if you change the image resource on that widget, however, the image will be freed, thus invalidating all the other widgets' references to it! The approach you take will depend on your situation and requirements. If the image is stored in a widget, the allocated members of images are automatically freed when an new image is specified or the widget is destroyed, provided that the appropriate bits in the flags member of the PhImage_t structure are set before the image is added to the widget. It's better to use images for animation than bitmaps, as images aren't transparent (provided you haven't created a transparency mask). This means that the background doesn't need to be redrawn when replacing one image with another. As a result, there's no flicker when you use images. For other methods of eliminating flicker, see “Flickerless animation”, below. It's also possible to create animation by using a PtRaw widget and the Photon drawing primitives. See “PtRaw widget”, earlier in this chapter. To animate an image you'll need a series of snapshots of it in motion. For example, you can use a PtLabel widget (with a Pt_ARG_LABEL_TYPE of Pt_IMAGE or Pt_TEXT_IMAGE) for animation. Create one PtLabel widget where you want the animation to appear, and create another PtLabel widget for each snapshot. You can store these snapshots in a widget database or a file. Create a picture module to use as widget database. Create the snapshots of the object in motion. Use the same widget type as you use where the animation is to appear. Give each snapshot a unique instance name. ApGetImageRes() returns a pointer into the widget database. Don't close the database while you're still using the images in it. You can also load the snapshots from a file into a PhImage_t structure, by using the PxLoadImage() function. This function supports a number of formats, including GIF, PCX, JPG, BMP, and PNG. For a complete list, see /usr/photon/dll/pi_io_*. Create a PtTimer widget in your application. PhAB displays it as a black box; it won't appear when you run your application. Specify the initial (Pt_ARG_TIMER_INITIAL) and repeat (Pt_ARG_TIMER_REPEAT) timer intervals. Create an activate (Pt_CB_TIMER_ACTIVATE) callback for the timer. In the callback, determine the next image to be displayed, and copy it into the destination widget. ABW_base_image is the widget name of the PtLabel widget in which the animation appears. Create a PtOSContainer (an offscreen-context container) and make it the parent of all the widgets in the area being animated. Use the PmMem...() memory-context functions to build the image in memory, and display it when complete. When you do animation in a child of an offscreen-context container, the PtOSContainer renders the draw stream into offscreen video memory, taking advantage of any hardware-acceleration features that the graphics driver supports. The graphics hardware can then blit the image directly onto the screen, resulting in flicker-free widgets and/or animation. PtRaw (like any other widget) can be a child of PtOSContainer. This means that you can have flicker-free animation even when using the Photon drawing primitives. The image structure must at least specify the type and size members. The image data buffer is optional, but if you want it in shared memory, you must provide it. The image type must be either Pg_IMAGE_DIRECT_888 or Pg_IMAGE_PALETTE_BYTE. Call PmMemStart() to set the current draw context to the memory context. Call PmMemStop() when finished your drawing, to return to the default draw context. Call PmMemFlush() to get the resulting image. When you no longer need the memory context, call PmMemReleaseMC(). In normal (nondirect) mode, an application sends drawing requests to the Photon manager. The graphics driver blocks on the Photon manager. Communication in normal (nondirect) mode. When an application enters direct mode, it's requesting that the graphics driver receive draw streams and service messages directly from the application, instead of from the Photon manager. The driver blocks on the application, which is now responsible for telling the graphics driver what to do. While in direct mode, the application has complete control over the display, since no other applications are able to be serviced by the graphics driver. The graphics driver's region is also no longer sensitive to draw events (this way the Photon manager discards all other applications' requests for rendering services to this driver). The other benefit with this mode is that graphical services are no longer sent through the Photon event space, so performance is improved. The drawback for this mode is that applications that expect to capture draw events can't record the application's view. For convenience, a new context type, called a PdDirectContext_t, has been created. This context, when activated, becomes the default context for the application, so all other Photon Pg* calls work correctly while in this mode. While in this mode, the origin of all drawing operations is the upper left corner of the display, since the requests are no longer clipped or translated by the Photon event space. Your application can still translate and clip the events by calling PgSetTranslation() and PgSetClipping() if necessary. When you enter or leave direct mode, all video RAM contexts (except the display), are destroyed on the driver side (an OSINFO event is shot out by the driver so applications are notified and can reinitialize any video memory contexts). This includes video RAM used by PdOffscreenContext_t structures and anything used by the video overlay API. When you leave direct mode, an expose event is also sent out by the driver, so all other applications redraw themselves. When you're in direct mode, the graphics driver region is no longer sensitive to draw events (so the Photon manager doesn't build up a massive list of draw events to be processed from other applications). If you have automatic double buffering turned on (e.g. devg-banshee -B ...), it's turned off while you're in direct mode (to let applications control the double buffering themselves). Here's how to get the address of any video memory context (including the display, which is considered to be one). If you create a direct context by calling PdCreateDirectContext(), and then enter direct mode by calling PdDirectStart(), your application “owns” the graphics driver (PgFlush() goes to the video driver directly, instead of to the Photon server). You don't need to be in direct mode to get a pointer to offscreen RAM, but you do need to be to get a pointer to the primary display. These API calls allow you to use the leftover memory on a video card. When a video card is in a video mode, there's usually video RAM leftover that isn't being used by the display area. These areas of RAM can be used to do a variety of graphical operations while still using the accelerator on the video card. They're treated in the Photon microGUI basically the same way that a memory context is used, but should be much faster because there's hardware acceleration for these areas. Here's an example that loads an image, creates an offscreen context for the image, and then blits the image data to the screen. It creates a window that contains a PtRaw, and uses PgContextBlit() in the PtRaw's raw drawing callback to redraw the image whenever the window is damaged or resized. You can specify a starting size for the window by passing -h and -w commandline options, followed by the path to an image (the format must be supported by PxLoadImage()). You need to have all the /usr/photon/dll/pi_io_* dlls and libphimg.so on your target to run this example. scale, then put it back into video RAM (over the PCI bus). /* raw widget draw function; simply blit the context onto the screen. Applications planning on using offscreen contexts should be sensitive to this event and reinitialize their off screen contexts accordingly. Draw stream commands don't draw while the offscreen context is locked. The memory is valid while the application is using it. Your application should lock offscreen memory for as little time as possible. If the graphics driver needs to do something with the offscreen memory, it tries to gain a lock itself, potentially blocking io-graphics for a long period of time (the result being that the display may not get updated, and the user thinks that the computer has locked up). The locks are implemented as semaphores in shared memory between io-graphics and the application. Create a lock for an offscreen context by calling PdCreateOffscreenLock(). You can arrange for a signal to be dropped on the application if a request is made to remove the offscreen context while it's locked. Lock the offscreen context, when required, by calling PdLockOffscreen(). You can optionally specify a timeout for the blocking. Unlock the offscreen context by calling PdUnlockOffscreen(). When you no longer need to lock the offscreen context, destroy the lock by calling PdDestroyOffscreenLock(). When you're debugging, you can call PdIsOffscreenLocked() to determine whether or not the offscreen context is currently locked. If you've locked the context, call PdUnlockLockOffscreen() to unlock it before destroying the lock or releasing the offscreen context. Alpha blending is a technique of portraying transparency when drawing an object. It combines the color of an object to be drawn (the source) and the color of whatever the object is to be drawn on top of (the destination). The higher the portion of source color, the more opaque the object looks. With a map that indicates the alpha blending to be applied to each individual pixel. Alpha maps are “pinned” to the origin of your draw command and are tiled if the dimensions of the map are smaller than the dimension of the drawing operation. A 32-bit color is made up of four 8-bit channels: alpha, red, green, and blue. These channels are represented as (A, R, G, B). When referring to the source, the channels are denoted as As, Rs, Gs, and Bs; for the destination, they're Ad, Rd, Gd, and Bd. There are several options for multipliers to achieve different blending effects. Flags are defined for source and destination multipliers in PgSetAlpha(). You can also perform an “alpha test”, which tests for certain conditions in the alpha channel before writing the source pixel to the destination. In an alpha test, pixels aren't blended — the source pixel is either written to the destination or it's not. For example, you can set the operation to only write the source pixel to the destination if the source alpha is less than the destination alpha. Masking on everything but the destination key color. The Photon microGUI supports 256 raster operations. Operations can be done using a combination of source pixel data, destination pixel data, and color expanded monochrome pattern pixel data. Extended raster operations are set the same way the normal raster operations are set, using PgSetDrawMode(). The extended raster operations are pervasive, meaning that they affect all subsequent drawing operations, including bit-blit operations and images. The old style raster operations still exist and behave the same way they did in earlier versions of the Photon microGUI. Logically OR the source data with the pattern data. For a complete list of all raster operations available, see <photon/Pg.h>. The width of the display, in pixels. The height of the display, in pixels. The number of bits used to represent a pixel. This affects how many unique colors you can see on the screen at one time. How many times per second the phosphor on the CRT of your monitor is updated (represented in Hz). The Photon microGUI's method of video mode enumeration is similar to the VESA spec, where there are “mode numbers”, numerical representations of the width, height, and pixel depth of a video mode. The refresh rate is independent of the mode numbers (it's a different member of PgDisplaySettings_t). The driver determines the mode numbers, so for one video card 640x480x8 might be mode 2, while on another card it might be mode 3022. Use PgGetVideoModeInfo() to determine the properties of any given mode number. Use PgGetVideoModeList() to get a list of the mode numbers supported by a particular graphics driver. Driver-level gradients — quick, but not sophisticated. Accuracy is sacrificed for speed. Application-level gradients — slower, but more accurate. A video overlay scaler is a hardware feature that allows a rectangular area of the visible screen to be replaced by a scaled version of a different image. The prescaled video frames are typically stored in offscreen memory, and are fetched from memory and overlaid on top of the desktop display image in real time, by the overlay scaler. Chroma keying is used to control what parts of the video frame are visible. Typically, the application picks a color to be the chroma-key color and draws a rectangle of this color where video content is to appear. When another application's window is placed on top of the video playback application, the chroma-colored rectangle is obscured. Since the video hardware is programmed to display video content only where the chroma-key color is drawn, video doesn't show through where the chroma-colored rectangle is obscured. Some display controllers allow you to transparently overlay multiple "screens" on a single display. Each overlay is called a layer. Layers can be used to combine independent display elements. Because overlaying is performed by the graphics hardware, it can be more efficient than rendering all of the display elements onto a single layer. For example, a fast navigational display can be implemented with a scrolling navigational map on a background layer, and pop-up GUI elements, such as menus or a web browser, on a foreground layer. Layer capabilities vary depending on the display controller and the driver. Some display controllers don't support layers. Different layers on the same display may have different capabilities. You should use PgGetLayerCaps() to determine whether a layer exists and which features are supported by the layer. Layers are indexed per-display, starting from 0, from back to front in the default overlay order. A layer is either active (shown) or inactive (hidden). It may not be possible to activate a layer if its configuration is incomplete (if, for example, the layer format is unspecified, or there aren't enough surfaces assigned to it). A layer's configuration persists when it's inactive. After a video mode switch, all layers revert to their default configuration. The images on all the active layers of a display are combined, using alpha blending, chroma keying, or both, to produce the final image on the display. The image on a layer is fetched from one or more offscreen contexts, also called surfaces. The number of surfaces needed by a layer is determined by the layer format. For example, a layer whose format is Pg_LAYER_FORMAT_ARGB888 requires one surface, while a layer whose format is Pg_LAYER_FORMAT_YUV420 requires three surfaces for a complete image. The format of a layer is set using PgSetLayerArg(). The "source viewport" defines a rectangular window into the surface data. This window is used to extract a portion of the surface data for display by the layer. The "destination viewport" defines a rectangular window on the display. This window defines where the layer will display its image. Scrolling and scaling, if supported by the layer, can be implemented by adjusting the source and destination viewports. To scroll or pan an image, move the position of the source viewport. To scale an image, increase or decrease the size of the destination viewport. You must target these functions at a device by calling PdSetTargetDevice(). The layer API is incompatible with the existing video overlay API (PgCreateVideoChannel(), PgConfigScalerChannel(), PgNextVideoFrame(), and so on). Don't run two applications that use different APIs simultaneously. Photon cannot render in offscreen contexts that are in a different format from the current video mode. Thus, it may not be possible to use Photon draw functions in an offscreen context allocated by PgCreateLayerSurface(). Instead, the application should use PdGetOffscreenContextPtr() to get a pointer to the video memory and write data directly into the video memory. If an application changes the main display's surface by calling PgSetLayerSurface(), Photon will continue to render on the old surface. The application should keep a pointer to the old main display surface and restore it when it releases the layer. See the code below for an example. Call PgGetLayerCaps() with successively incremented indexes to enumerate your hardware capabilities (unless you already know them). If PgGetLayerCaps() fails for all values, the driver doesn't support layers. If you want to prevent other applications from accessing a layer, call PgLockLayer(). Allocate surfaces for the layer, and offscreen contexts for the surfaces, by calling PgCreateLayerSurface(). Call PgSetLayerArg() with an arg argument of Pg_LAYER_ARG_LIST_BEGIN. Call PgSetLayerArg() to set other arguments as required. Call PgSetLayerSurface() to display a surface's offscreen context on a layer. Call PgSetLayerArg() to set other arguments as required. You can specify Pg_LAYER_ARG_ACTIVE to display the layer. Call PgSetLayerArg() with an arg argument of Pg_LAYER_ARG_LIST_END. If the layer format is one of the RGB or PAL8 formats, set the current draw context to render into a surface's associated draw context(s), and then use the Pg* functions to draw into the offscreen context. If the layer format is YUV, and so on, you typically dump data directly to the buffer (like the video channel buffers). If you locked a layer, you must use PgUnlockLayer() to unlock it before your application exits. See the code below for an example of using the layers API. * For best results, these values should match your video mode.